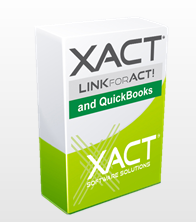 "The Xact Link for ACT! and QuickBooks is the best link I have seen for ACT!" - Katharine Stalcup, Sage ACT! "Your QBLink is slick. I’ve tried a few before, but this is my favourite." - Ken Quigley, Keystroke Quality Computing Inc.
"I can’t tell you how much easier the Xact Link for ACT! and QuickBooks was to install and my client is ecstatic about all of the features." - Stan Patey, Slingshot Information Systems Inc.